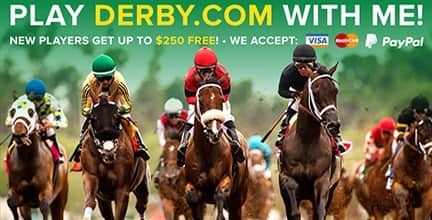 Visit Derby Jackpot Get Up To $250 in Welcome Bonus! Thanks to online revolution, horse racing has gone through some significant changes that make it what it is today. Now, there is something for everyone, even for the casual gamer. Derby Jackpot is for horse racing enthusiasts who just want to get the periodic thrill of wagering on the runners without spending big money. If you are a casual gamer, then social gaming is what you need. 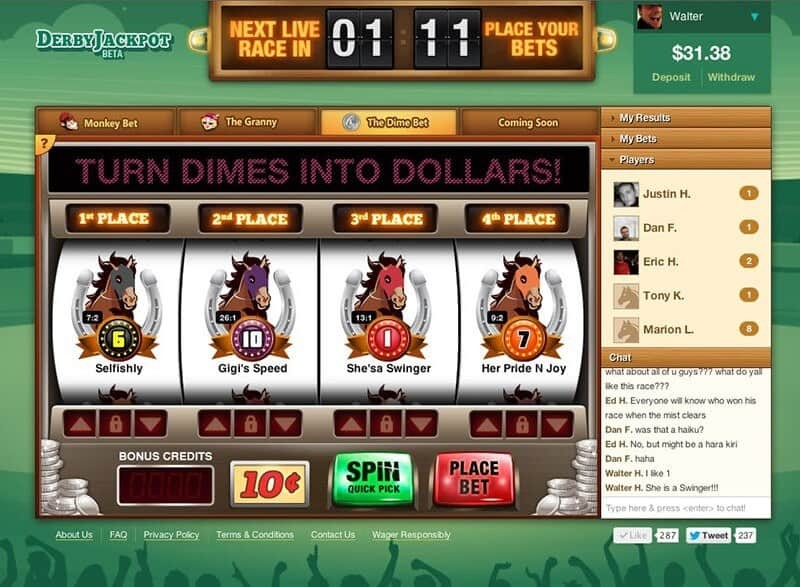 Derby Jackpot is one of the most popular social gaming sites, dedicated for lovers of horse racing. Our Derby Jackpot review will cover all aspects of playing this social gaming app. Founded back in 2012 by Xpressbet, Derby Jackpot, which is part of Derby Games, takes full advantage of the legal loophole meant to accept horse racing as the only legalized form of internet betting. And even better, at least for those who wager for the fun of it, it is a social gaming site. Meaning that you can connect with lots of your friends via Facebook since to have an account, you need to log in via your Facebook credentials. Spare a few minutes and read this cut-comprehensive Derby Jackpot online review and find out what it’s all about. Derby Jackpot essentially makes the process of wagering on thoroughbreds much easier than having to jeer all over as you hold your hat at the jam-packed Kentucky Derby. At first glance, this is one of the most attractive social gaming apps. The graphics are easy on the eyes and navigating through the site options is as simple as it gets. It’s basically as awesome as what you will get on a full-on gambling site for horse racing, with the same amount of adrenalin bursts and thrill. After creating an account, which by the way is just logging in with your Facebook details on this social gaming site, you can pick a horse or horses and start wagering actively. The site will give you a chance to wager on more than 100 super exciting tracks across the country. In fact, what makes it even better, there is a feature which will allow you to watch a real-time feed of the mighty thoroughbreds running for first place. Keep reading this exclusive Derby Jackpot review and you will know why you should join in on the excitement. As we went on with our Derby Jackpot mobile review, the experience was outstanding, whether you play the game on a smartphone, tablet or even an iPad. In fact, for devices based on Apple’s mobile platform iOS, there is a dedicated app where you can download from you iPhone or iPod. When it comes to all the other platforms, you will have to stick to the full site which is remarkably responsive. This is one of the finest social gaming sites out there, thanks to the mobile experience. You can use your Blackberry, Samsung Galaxy S7, Microsoft Lumia, Huawei P9, or any other Android device. The full site will nicely fit the size of your screen like a ‘digital glove’. If you are an iPhone, iPad or iPod Touch user and you want to swiftly wager on horses under no pressure, download the Derby Jackpot social gaming app now. This is perhaps the most exciting part of this Derby Jackpot review. Once you have registered, you are supposed to set up your depositing options. After that, you will be ready to start placing wagers. 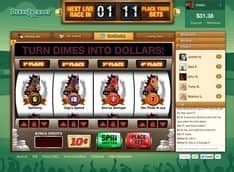 Unlike most of the other social gaming apps today, Derby Jackpot is actually about more than just the thrill of wagering. You actually get to place bets on live horse racing events from the United States, England and Ireland. But then, even though there is actual placing of wagers on real-time events, unlike a real money gambling website, the Derby Jackpot social gaming site does not provide real cash winnings when your horse becomes the victor. That is what makes it fit the category of social gaming applications. The Dime Bet: This will only cost you 10 cents and if you match the first 4 runners in order, you will win big. The Fiddy: This is a very interesting wager, you bet slot-machine style with every symbol on the slot representing a specific horse. For you to be a winner, all the three runners have to finish first, second and third in the exact order. Another aspect of this social gaming site that stands out as we discovered during our Derby Jackpot online review is the variety in payment methods that you can use. The most unique method of payment is Bitcoin. Even on regular online bookmaker sites, Bitcoin is rarely used as a payment method. Apart from Bitcoin, you can use any credit card, even your Walmart Card and Starbucks Card. You can also use your MasterCard and yet again, there is another surprising method of deposit: prepaid voucher cards. You can use your Green Dot MoneyPak prepaid voucher to make a deposit into Derby Jackpot so that you can wage on the ponies. Such a voucher can be purchased at any gas station and then, you should redeem it online at the official Derby Jackpot site. Finally, InstaFund is another payment method that you can use here. If you don’t know about it, it is just a system that can transfer funds directly into your online account and it is used by most major banks such as Well Fargo and Bank of America, through the bill pay feature. It seems like the developers of this social gaming app know the real meaning of flexibility and freedom! As we noted in our Derby Jackpot online review, the major setback about this social gaming site is that online gambling isn’t allowed in some states. Thus, if you come from states such as Mississippi, Utah, Texas, the Carolinas and Missouri, you can’t use Derby Jackpot. This means that you first have to confirm whether it is legal to gamble in your state before you start using this social gaming app, otherwise, you may end up in legal trouble. 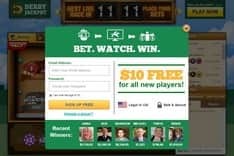 To begin with, when signing up at Derby Jackpot, you are awarded $10 in free bets right after your first deposit, which should be at least $10. From there, with every extra amount of initial deposit there is a specific difference bonus that is awarded to you and it can go up to $250. For the jackpot, you have to make nine consecutive winning wagers in this order: 3 Granny bets, 3 Donkey bets and finally 3 Monkey bets. Successful completion of these levels within 24 hours will earn you between $2,000 and $10,000 in progressive jackpots or even more. Remember, every game will cost you $4. There is also a jackpot for the lotto section of the game which is usually exclusively meant for social players. After verifying your account, you get a ticket and you can win either, $10, $1,000, $10,000 and $100,000. 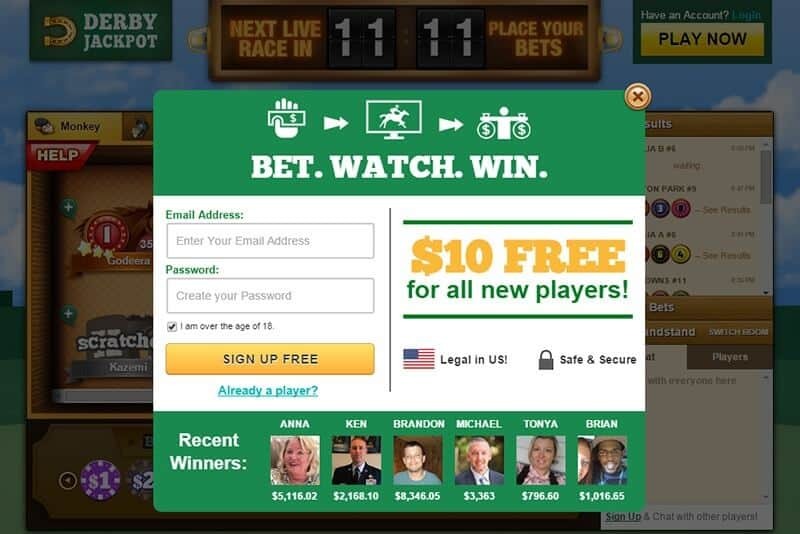 Clearly, from this Derby Jackpot online review, if you are looking for an occasional thrill from betting on horses, then you should sign in at Derby Jackpot. If you are more of a big gambler, you better go for the actual action on real money gambling websites. Even so, irrespective of your wagering habits, the Derby Jackpot social app presents a one of a kind experience. Overall, this social gaming application gets our official seal of approval. Sign up if you are looking for something more casual and social with the extra jolt of wagering excitement.